When a recipe calls for peanut butter, I've gotten into the habit of just estimating by sight the right amount. Because I hate cleaning measuring cups that have peanut butter all up in there. It's annoying, right? No one likes to clean peanut butter off things. It's sticky. It sticks. I think I over-estimated the peanut butter and under-estimated the Nutella. Because you can definitely taste that slight hint of peanut butter, but the Nutella gets virtually lost in the mix. Or maybe I just have a tongue that likes the taste of peanut butter more, thereby picking it up more. Or not. Because Nutella already has chocolate in it, so it's not a surprise that its flavor gets easily lost in a chocolate-based dessert. And, you know what else? My eyes may have overestimated the peanut butter because, well, I like peanut butter. And Nutella? I'm only on the fence about. I'm not sure. It's okay. I'm sure this is blasphemous to many a person, but you know what! Whatever. It's not like I need to be obsessed with some other fatty buttery spread. Peanut butter, my lifelong friend, can do that all on its own. At any rate! These brownies. They're pretty good. I would not hesitate to experiment a little with ratios, though, because they get hard pretty quick. 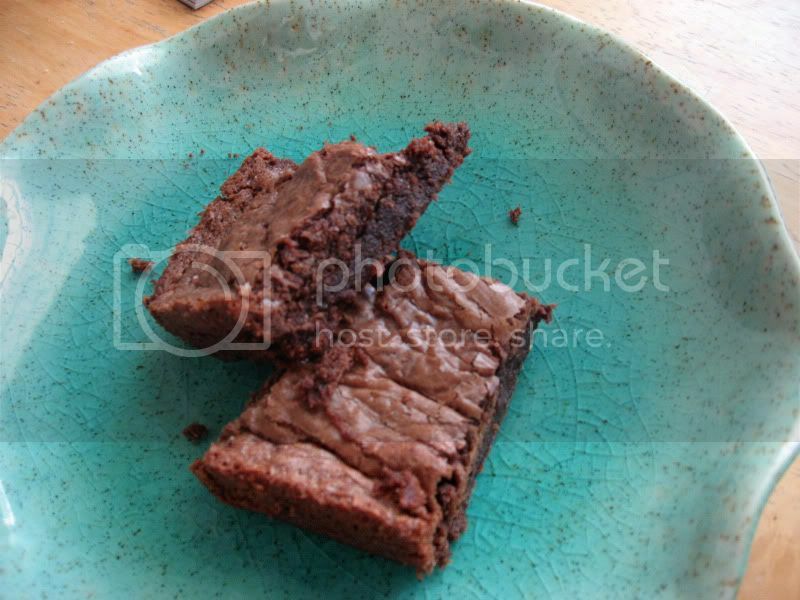 I like a brownie that can hold its own for a few days, rather than just one. 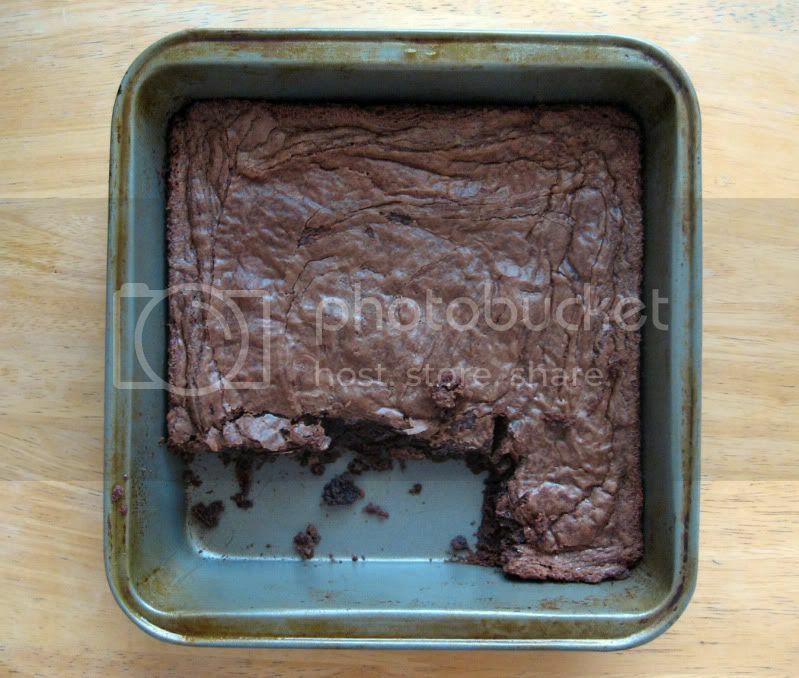 My least favorite thing about brownies? The crusty top. Preheat oven to 350F. Either line an 8x8 baking pan with parchment paper, or just spray it with some non-stick spray. Measure flour, cocoa powder, baking powder and salt into a small bowl and whisk to combine. Stir the sugar into the melted butter. Beat in the eggs one at a time until each is combined. Stir in the vanilla. Add the dry ingredients and mix until combined. Put the Nutella and the peanut butter in a small, microwave-safe, bowl and microwave 30 seconds. Stir it around and get it all mixed together, then fold into the brownie mix. Pour batter into pan and bake for 20-25 minutes or until top forms a crust and a toothpick inserted into the middle comes out clean. Remove from oven and let cool for 15 minutes. Cut, devour, enjoy. I forgot to take pictures of the step-by-step stuff. "Forgot," as it really was just night, and therefore dark, and therefore devoid of natural light, and therefore hard to get good photographs. And night cravings for brownies just won't be denied, blog be damned.